Anyhow, I have a nice early Pete Matthews that happens to be one of these. The frame is from about '73-74ish from what I can gather, and I am almost certain came with tubular (700c) size. I assume this, because the frame has eyelets for mudguards, and there's not nearly enough clearance for a mudguard in the front if running 27's. In fact, even oldschool brake calipers aren't short enough(!) for the front in this case. 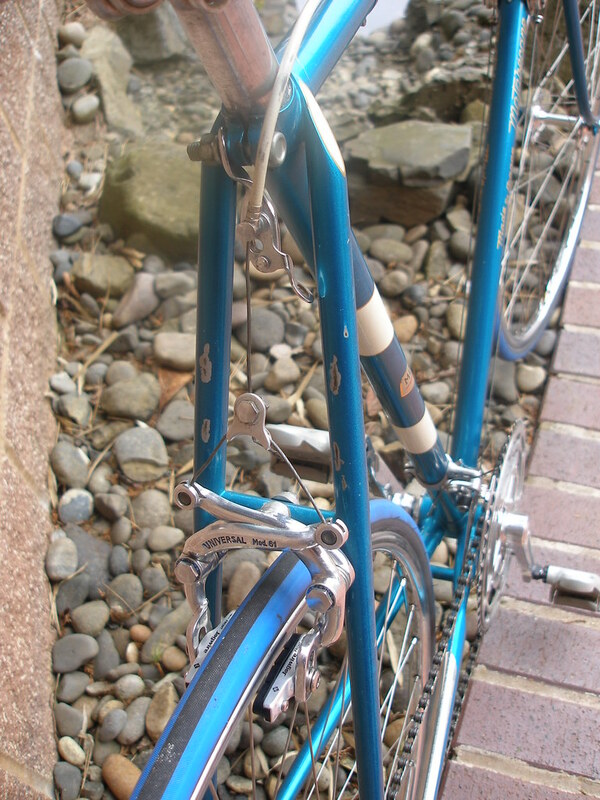 The frame is Reynolds with high spec components and strangely, vertical dropouts (therefore, the distance of movement horizontally of the back wheel in the dropout has nothing to do with clearance in the rear caliper, as is some theory). Now, when running 700s, I require a brake caliper with a reach of appx 47mm for the front, and 65mm for the rear. Does such a caliper exist?!! I know some came with a longer rear caliper, but which decent quality caliper might this frame have come with originally?? When I purchased the bike it had Weinmann Carreras, which MAY have been the original, but because the reach isn't long enough in the rear, the slot has been filed significantly. A little too much for my liking. Weinmann 500 for the front. 630? Maybe for the rear. Universal 68's came variable reach as a set. That is not a surprise. My Motobecane Le Champion was delivered to the dealer with sew ups. Universal MOD 61 centerpulls were also standard. I installed a set of Superbe brakes a few years later and could not get the rear pads completely on the rim of 700c clinchers (Rigida 1320). Most English and Japanese frames came with Weinmann or DiaCompe 610 front, 750 rear. The asymmetry provides greater braking leverage in front, where it is needed. What kind of oil for a three speed?